Financial: With rising food prices and concerns about pollutants in our store-purchased food items, more and more people are considering growing their own vegetables. Some are doing so well that they have turned their "backyard garden" into a business, supplying local restaurants and stores with their surplus organic produce. Nutrition: Home-grown vegetables are far more nutrient-dense than vegetables that have been massproduced and transported over many states. Calculate storage into that, and it is obvious that a lot of the health-conducive nutrients are gone. Fertilize all of your vegetables regularly to keep them healthy and heavy producing. Weed control is essential especially in the first six weeks after planting. An organic mulch about two inches deep will conserve soil moisture and reduce weed problems. Beans are warm season vegetables that are very popular with gardeners. Beans also return nitrogen to the soil, so they offer a double benefit. They are very easy to grow: drop a few seeds in a hole and cover them with compost. It's best to grow these beans in warm weather as they don't like the cold. Fertilize along the row where your beans are to grow. Don't allow your bean seeds come into direct contact with your organic fertilizer. Don't soak seeds before planting. Sow your beans directly where they are to grow, into damp soil, and avoid watering near them for the first few days. Space rows at 24 inches and push seeds about an inch into the soil, 4 inches apart. To get a continuous supply of beans, start your next sowing when the first crop has grown their first true leaves. Feed with a liquid organic fertilizer when flowering starts. Harvest your beans while they are young and tender. They will taste better and they will give you much better yields. 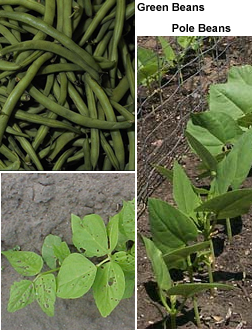 Green Bush Beans aka String Beans or Snap Beans: Bush beans don't need support, yield well and require the least amount of work. Bush varieties should be planted about two inches apart. Regular harvesting encourages growth of more beans. Pole Beans require climb supports. These beans should be planted from seed about 6 to 12 inches apart. Beets do best when planted in loose soil. They can be planted throughout spring and summer. Take your seeds and soak them overnight. Sow directly in the soil, about half an each deep and 10 to 12 inches apart. Cover lightly with soil and water them in. 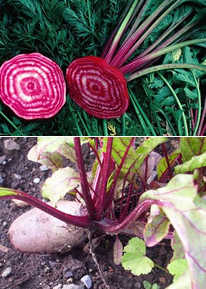 Pull your beets about 8 to 10 weeks after planting, when they have grown to about 2 to 3 inches in diameter. Don't allow them to grow too big, as they will become tough and woody. Planting a second crop about two weeks later will provide you with a continuous supply. If your soil is a little too acid, add lime to your soil a couple of weeks before planting. Pumpkins grow in similar conditions as zucchini. 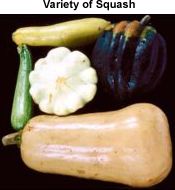 Squash Pumpkins, as well as summer and winter squash, spread easily across your garden. Have your mounds about a yard / meter apart. Keep them watered especially in really hot and dry weather. Feed every three weeks with mature compost. Leave the pumpkins on the vine to fully mature. Harvest before any chance of frost. Wait until the vines have died off before harvesting. They should be ready to harvest at 14 to 20 weeks. Harvest by cutting the stems at least 2 inches from the pumpkin. These warm-climate vegetables will not set fruit if the overnight temperatures are too low. You can grow them in pots. You may need to stake capsicum for wind protection, as they can reach up to 30 inches. Sow in seed boxes in spring. When your seedlings have reached 6 inches, transplant them into beds prepared with compost at about 20 inches apart. Feed with a liquid organic fertilizer at about 4 or 5 weeks when they start to flower. Make sure you don't over do it, or you will end up with very healthy plants with lots of leaves, but very little fruit. 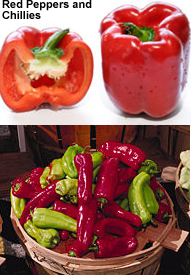 You can harvest capsicum at any time, but if you wait for the fruit to turn red (they all start out green) they contain much higher level of vitamin C. Leave chillies on the plant to mature, then they can be harvested. If you want to dry some just leave them in a dark, dry, airy place for several weeks. They will store well in glass jars. Touching your eyes after handling chillies can be very painful. It's best to wash your hands immediately after handling. 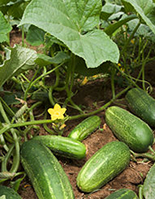 Cucumbers can be planted as seed after the last frost (in late April or in May), one-quarter inch deep. They don't require fertilizer except in very poor soil conditions. If you are looking for easy-care lettuce, it's best to avoid head lettuces. 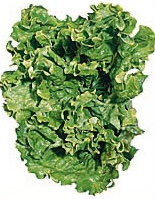 Leaf lettuces are a great choice in cooler or temperate climates. Lettuce is a fairly hardy and thrives when the average daily temperature is between 60 and 70°F. It should be planted in early spring or late summer. Lettuce likes sun but will tolerate some shade. Sow the seeds thickly in rows of well-drained soil, and cover with a fine potting soil, tamping down after covering. Water well. Keep them well watered in hot weather and apply organic fertilizer every month, giving them an occasional feed with an organic liquid fertilizer. Mulching with compost or pea-straw will help conserve water, control weeds and feed your soil. You can cut the lettuce leaves as they are growing, trimming away just what you want to eat, and leaving the core, which will prolong the growing life of the plant. You can also plant spinach or Swiss Chard, both equally as easy to grow from seed with high yields. When the leaves are big enough to use, pick from the outside making sure you leave at least 5 or 6 stalks in the centre for the plant to continue growing. Boston lettuce and the slightly smaller Bibb lettuce are fairly easy to grow. Plant the seeds one-quarter inch deep and 4 to 7 inches apart at any time after the last frost, then water every other day. You can expect to be able to harvest in six to eight weeks. Silverbeet, Spinach or Swiss Chard are also easy to grow. Spinach grows best in cooler climates, but silverbeet will grow all year round in temperate zones. If you're growing them from seed, soak them overnight. Sow seeds about 12 inches apart by placing them on the soil surface and poking with your finger to the depth of about half an inch. Cover with soil and water in well. 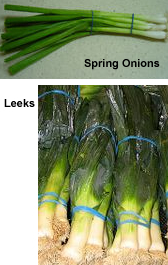 Leeks and spring onions grow in very similar conditions. You can grow in seed raising mix or seed directly where they are to grow. If you grow seeds in punnets you can transplant seedlings when they are about 8 inches tall into well prepared beds. If your soil is acidic, you may want to add a little lime. Give them plenty of water. Mulching helps keeping the soil most and to keep the weeds down. Apply organic fertilizer every few weeks. Harvest when leeks are about one inch thick, and spring onions are harvested when they are big enough. Potatoes require very little maintenance. They can be grown in space-saving patio tubs, raised beds, or the traditional earthed-up rows. "Early" and "Late" varieties are ready after about 75 and 90 days respectively; maincrops take 135 to 160 days. Planting is possible at any time your soil is workable (meaning not water saturated or ice-bound), and warm enough for weed shoots. There should be sufficient time for plants to reach maturity before winter frosts. Radish is a cool-season vegetable that is easy to grow and the quickest vegetable to emerge - growing from seed to eating in as little as 4 to 5 weeks. They thrive in all climates, all year round in temperate zones. They can be grown wherever there is sun and moist, fertile soil. Do make sure the soil is not too compact. Early varieties usually grow best in the cool days of early spring, but some later-maturing varieties can be planted for summer use. Winter radishes are sown in mid-summer to late summer. They are slower to develop than spring radishes; and they grow considerably larger, remain crisp longer, are usually more pungent. Space young eggplant plants about two feet apart in the garden. Eggplants benefit from 5-10-5 (5% nitrogen, 10% phosphorus and 5% potassium) fertilization every two to three weeks. Make sure to follow the directions on the label. Suggested varities: Classic or Ichiban eggplant. Peas are a cool-season crop and may be planted in early spring as soon as the soil can be worked. Sow seeds about one inch deep and two inches apart in the row, in well-drained soil with a sunny position. Low-growing varieties can be grown in rows 18 to 24 inches apart. Provide support with small sticks or similar until they reach what you want to grow them on. Good drainage is essential. Keep moist in dry weather. Feed with an organic liquid fertilizer every 3 or 4 weeks. Peas like a higher pH than most vegetables, so add some lime into the soil along with mature compost or organic fertilizer. Harvest regularly to increase yields. Tomatoes will grow in most soils and all but the coldest climates. They can easily be started from seed grown indoors. Simply plant them in small pots with sterile soil, and transplant after the last frost. Alternatively, purchase young plantsand plant them after the last frost. Tomatoes benefit from being planted deeper than they were in the seedling box. This actually benefits the plant as they grow roots right up to the soil surface, giving it more stability and accessibility to water and nutrients. If growing them in the ground, give them at least 20 inches spacing. Deep water you plants regularly. If you planted your tomatoes in a compost-rich soil, you will only need to liquid fertilize when fruiting starts. Use a good organic liquid fertilizer and use as a foliar spray. Pick your tomatoes as they ripen, to encourage more fruit. Roma Tomatoes: Roma tomatoes are more disease resistance than other varities, which makes them easier to grow. They have few seeds and taste good sliced or in tomato sauce. 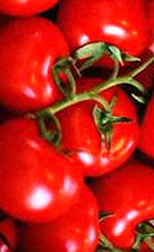 These tomatoes like a light, phosphorus-rich fertilizer, such as 5-10-5 (5% nitrogen, 10% phosphorus and 5% potassium). Make sure to follow the directions on the label. Cherry Tomatoes: Cherry tomatoes are the easiest to grow. They will even grow well in tubs. They don't need to be staked - provided you don't mind them sprawling around. They are sensitive to frost, so it's best to start them indoors if you are in a colder climate. When your seedlings get to 5 - 8 inches, transplant them into tub or the ground. If you are going to stake them, get your stakes in first so you don't damage the root system. 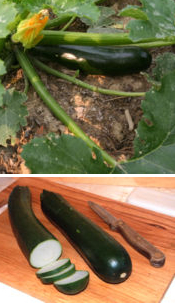 Zucchinis are relatively easy to grow. They like warm growing seasons. Among the zucchini varieties, the green zucchini tends to produce the most fruit. Sow about three seeds directly into a mound of richly composted soil after frosts are over (April or May). Space them two to 2 1/2 feet apart so they have room to grow, and bury the seeds one-quarter inch deep. Zucchini benefit from 5-10-5 (5% nitrogen, 10% phosphorus and 5% potassium) fertilization every three to four weeks. Make sure to follow the directions on the label. When the seedlings are about 4 inches tall, gently pull out all but the strongest plant. Give them plenty of water. When the zucchini reach between 6 to 8inches, they can be picked. Zucchini can be trained up a trellis or fence, which can help prevent powdery mildew. They can grow really quickly, so keep an eye on them otherwise you will end up with inedible veggies. You also want to pick them as soon as they are ready to increase the yields.